We got home from California last night and I am pretty exhausted so this is going to be short and sweet. 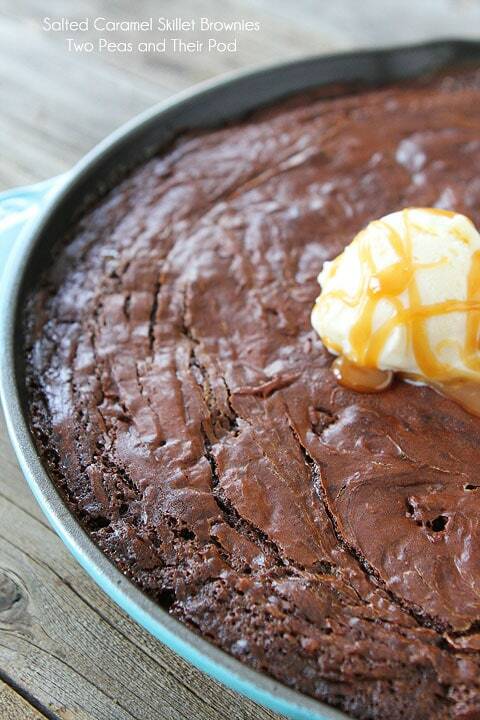 And when I say sweet, I mean very sweet, as in Salted Caramel Skillet Brownies. Holy sweetness! 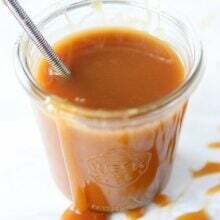 I hope you’ve all had the chance to make our Salted Caramel Sauce. It rocks the house and it rocks it all the way down! I made our salted caramel sauce a few weeks ago and I decided to play around instead of just eating it by the spoonful. I created not one, but three fabulous salted caramel recipes. I was going to space them out, but then I decided to go crazy and post them all in one week. So this week is officially salted caramel week on Two Peas and Their Pod. Fasten your seat belts and get ready for a sweeeeet ride. First up, Salted Caramel Skillet Brownies. I appreciate elaborate fancy desserts, but my favorite desserts are always the classics-cookies and brownies. You can’t go wrong! I will never turn down a good brownie. Well, maybe I should say no this week. I ate a few too many sweets on our trip. It’s time to detox. But I am usually all for a fudgy chocolaty brownie. These brownies are extra special because they have salted caramel sauce swirled into the rich brownie batter. Oh yeah! I made the brownies in a cast-iron skillet because I love the rustic skillet look. 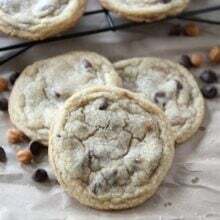 You can make these in a 9×13 pan if you don’t have a skillet. They are good either way. I topped the brownies with ice cream and extra salted caramel sauce. I about fainted after I took the first bite. I had a feeling they would be good, but WOW. These Salted Caramel Brownies are out of this world. I was only going to eat a bite, but then I had another bite and another bite. I couldn’t stop. They were so good! I licked my plate clean and went into a happy sugar coma. Make a batch of Salted Caramel Sauce and get your brownies on! 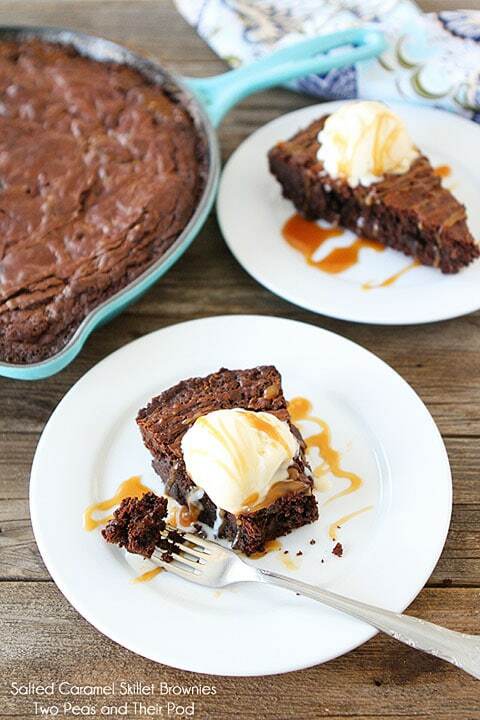 You all need to experience these Salted Caramel Skillet Brownies. They are life changing! Make sure you come back for more salted caramel recipes this week. It’s going to be a good week. I can feel it! 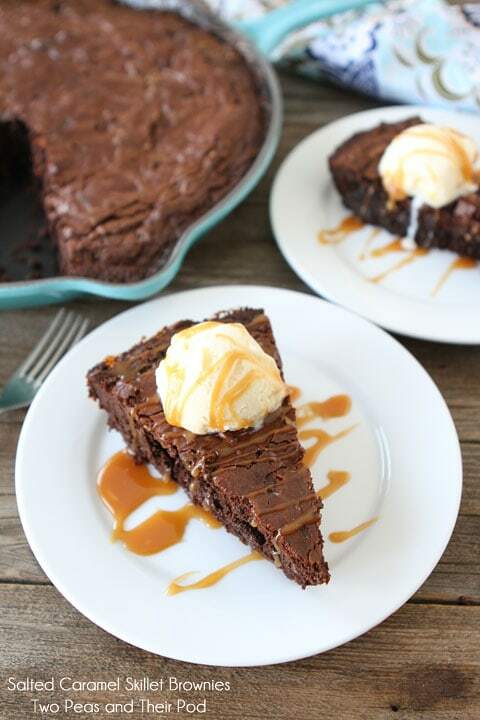 Fudgy skillet brownies with salted caramel swirled throughout! Top with ice cream and a drizzle of salted caramel and you will be in dessert heaven! We love these brownies! Preheat the oven to 350°F. Grease a 12-inch cast iron skillet and set aside. In a large saucepan, melt the butter over medium heat. Add the sugar and stir to combine. Return the mixture to the heat and stir until smooth and the mixture is shiny. Remove from heat and stir in the cocoa, baking powder, salt, and vanilla extract. Add the flour and chocolate chips. Stir until just combined. Pour the brownie batter into the prepared skillet. 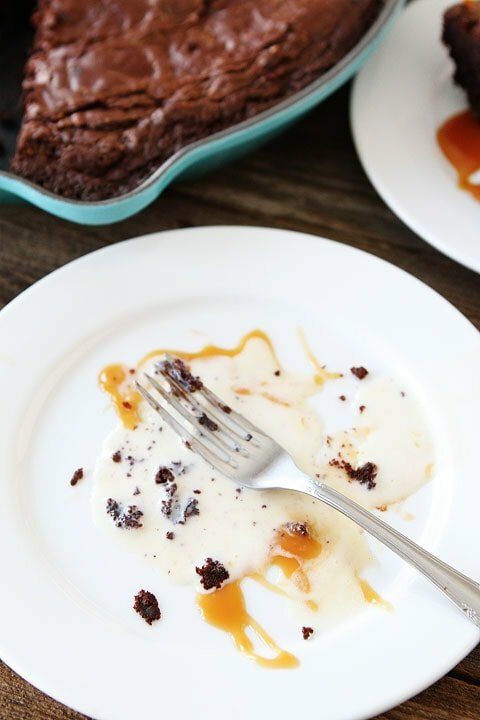 Drizzle the salted caramel sauce over the brownie batter and gently swirl the caramel into the batter with a knife. Bake the brownies for about 30-35 minutes or until a toothpick inserted into the center comes out with just a few moist crumbs clinging to it. The brownies will be a little gooey. Remove the skillet from the oven and cool completely on a rack before cutting and serving. Serve with ice cream and additional salted caramel sauce, if desired. Note: If you don't have a skillet, you can use a 9x13 pan. Welcome home! It was great to meet you finally after all these years! And salted caramel week – that sounds wonderful. And these brownies look too good! I cannot resist really fudgy brownies either and these would be so me! these brownies looks INCREDIBLE! i love how simple they are to make in the skillet. I love salted caramel anything, so I am really looking forward to this week on your blog! Your pictures, oh man the picture of the brownies, look incredible. I am sooooooooooooo drooling over the pictures!! ummmmm delicious!!! Is it weird that it’s first thing in the morning and this is all I want to eat?! I dont think I could stop myself either. Actually, I know I couldn’t stop myself! Brownies are my weakness. Ahhh, who am I kidding?? ?Desserts are my weakness. Well if were being honest here…FOOD is my weakness…..sigh. Salted caramel week sounds kinda like the best week EVER. Can’t wait to see what else you have in store! These brownies look amazing! Definitely the perfect blend of sweet and salty! OMG! I am dying over here. DYING! This looks so heavenly!! The brownies, the caramel and the ice cream!! Mothers day dessert for sure! Hope someone remakes this for you! These brownies look amazing!!! Wow, I am so drooling now and so is my 2 year old who ran up to the screen when he saw these pics hehe 🙂 Yum! These brownies are just the push I needed to re-season the three cast iron skillets i’ve rescued lately. Love salted caramel and vanilla ice cream! 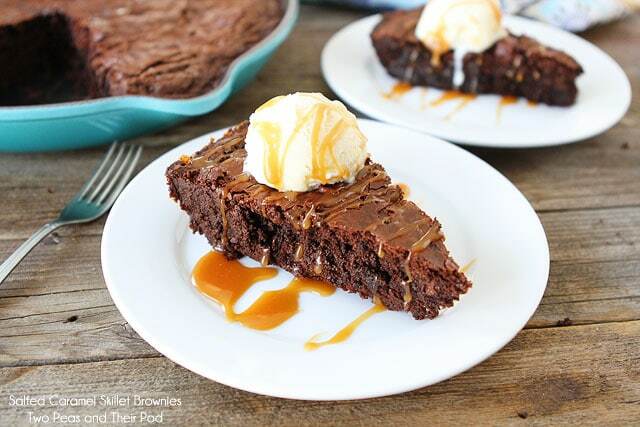 Caramel and chocolate are so good together and those skillet brownies look amazing! You had me at salted caramel! These look like the perfect simple dessert! I’ll take salted caramel any day, especially on a brownie. Love this! Did you really say salted caramel week? I am so here!!! This is what I call a Perfect Monday start!!!!! Yeah baby! Wow, I’m dying over these brownies!! OH my word, this is dessert perfection. I need a giant slice for breakfast!! Why do I bother with Beet Week, Zucchini Week or Leftover Ham Week when in truth what I really really want is Salted Caramel week? My 12 inch skillet is calling from the kitchen saying “get in mah belly”. These brownies look amazing. And I have a pint of Graeter’s Caramel ice cream in the freezer . . .
Looks yummy!! Hope you all got home quick and safe! I know where I’m hanging out this week!! 😉 Stunning, Maria! Looks delicious! Caramel and chocolate, yum! Wowza! Now that’s my kind of dessert! Looks incredible. I love the idea of making brownies in a skillet. They must be so crispy on the outside, which I love! I’ve never made the salted caramel sauce, but I most certainly will get around to it! Salted caramel and chocolate – what a pair! I could eat the two together for the rest of my life. I want a salted caramel chocolate cake of sorts for our wedding, but that probably won’t happen. 🙁 Love these brownies Maria! 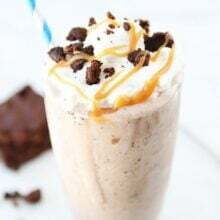 Chocolate and salted caramel are a match made in heaven!! Great to see you and your family at BTP1 this weekend! These brownies are gorgeous. Would it be too much if I paired the brownies with a salted caramel ice cream??? This is amazing!! I still haven’t made a skillet brownie; this makes me want to put it as #1 on my to-do list! Deeeeeelicious! I love brownies, so these are right up my alley! Love all your desserts. This looks amazing! Salted caramel week? Yes please! Love these brownies. These brownies sound great! I love the idea of baking them in a skillet! YUM!!! Absolutely love caramel and brownies together! There is no way I would stop at one bite either. Too good! Salted caramel AND brownies together? Yes, please! It’s almost dinner time…can I just eat these for dinner tonight? Lord have mercy. haha. These look AMAZING!!!!!!!!!!!!!!!!!!! Holy cow, Maria — this skillet brownie looks out of this world! I am obsessing over that salted caramel sauce. Hand me a spoon and I’ll be in heaven! Happy to hear you guys all got home safe and sound! I wish a pan of these brownies was on my counter when I walked in the door tonight – gaaaaaaaaah, they’re insanely decadent and perfect, Maria! All these skillet recipes are making me feel the necessity to go out and buy myself a big ole skillet to make some skillet brownies in! Especially these…oh man. Salted caramel anything and I’m in! 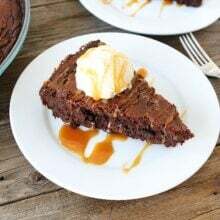 These sound fabulous, and I love the extra drizzle of caramel on top – can’t ever have too much 😀 Thanks for the recipe, pinned, and totally making when I get my hands on that skillet. LOVE this! As usual, Maria! OMG. 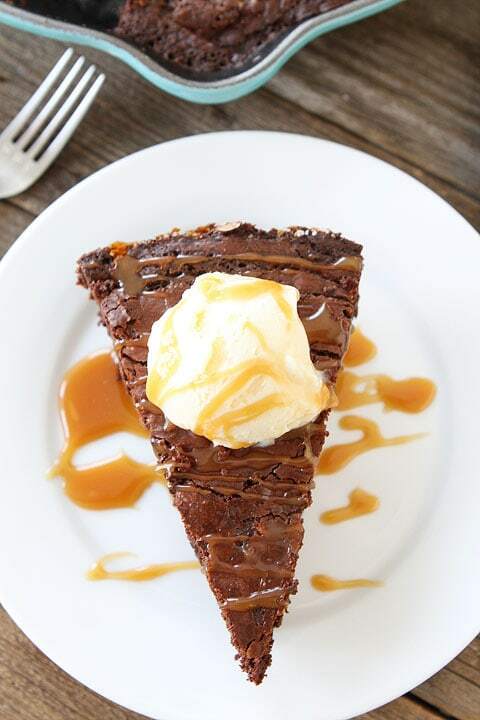 Brownie + Pie = Fabulous. This is gorgeous! I want to make these, but the only skillet we have is heavily seasoned with savory dishes. What are your thoughts about making sweets in a savory skillet? My husband loves caramel swirl brownies. We are totally down with trying this recipe. Always looking for a reason to pull out my skillet.. this is one of them!!! These brownies look AMAZINg… love anything with salted caramel! This looks too good to resist! I can’t wait to see what other caramel goodness you’ve come up with!!! Ahmazing, brownies are my fav dessert! Loving the cast iron skillet too, great idea! These look so good, can I have one!! Haven’t had brownies in a long time! These look amazing. I’m all about the salted caramel sauce. Looking forward to the other recipes this week! Oh Maria! These brownies sound fabulously decadent. I wish I could have one as a late-night treat tonight. Love that you baked them in a cast iron skillet! Holy smacks girl! Made the salted caramel sauce and fell in love! This looks AMAZING! I would love to try it! I just made this and I think one cup of caramel sauce swirled in is way too much. They are still cooling, but they do not look like yours. The batter was swimming in the caramel sauce when I put it in the oven. I would like to try again, but please clarify if you are not supposed to use one cup of caramel sauce as stated in the recipe. BTW, I love your blog and love the lime and coconut creations! I made previous comment on May 12, 2013 @ 9:01 pm. I think it is possible that my caramel was thinner than yours. When I cut it open it looks like normal brownie. The top is what looks bad, lots of bubbles and sunk in areas. It taste heavenly! Please still let me know if you think mine came out thin to cause this or should I just use less sauce next time. You can try reducing the caramel to 1/2 cup or 3/4 cup. Our brownies bubbled a little on the edges, but not much and we used 1 cup. I’ve made these twice now for potluck suppers…the second time for Canadian Thanksgiving with friends today…and blew everyone away. So fabulous, and absolutely the best salted caramel recipe I’ve tried. 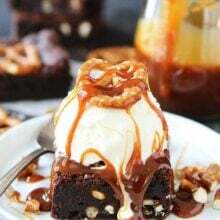 The brownies turned out perfectly fudgy and chewy and melt-in-your-mouth, and I topped them with vanilla Haagen Daz and a drizzle of the sauce…YUM! I discovered your blog through a search for salted caramel, and I’m so happy with this recipe that I’m eager to try more from your site. Thanks, guys! I’ve never had a skillet brownie but it sounds amazing with this sauce! I made these brownies with Hershey’s ‘special dark’ powder and ended up doing this exact recipe but my brownies came out looking really weird and had a bunch of holes all over the top. Did I do something wrong here? Made these for a Super Bowl party today… widespread approval all around! Thanks for the great recipe! I just made my first batch of caramel sauce and have a question; the sauce is not as thick as caramel normally is; Would that be because it’s still hot? Can I still use it in my brownies? It will thicken as it cools. You can use it in your brownies! What is the Dutch process cocoa? Have never heard of this. The recipe says to stir sugar into melted butter over the heat until smooth and shiny. Well, I tried that and I got rock hard sugar and it never did turn smooth. What did I do wrong? Can you use Hersheys 100% Natural unsweetened Cacao?